This machine is listed in the DataMaster Online database (aka "DMO"). DMO is a unique source of highly organized information about all the printing equipment on the market (going back to 2007). Thousands of Copiers, Printers and Solutions! benchmarking: copiers, printers, A4/A3/SRA3, multi-functions, digital presses, color/monochrome, productivity tests, DMS, document capture, MFP, MPS, print accounting, device management, comparisons: a one-stop shop for all the information you need! Find out more about DMO here! Find out more about DataMaster here! Set up a free trial of DMO here! Want to know more about our services? Contact us! DataMaster issues a Certificate after testing a machine in its independent laboratory. More than 40 tests are carried out to evaluate the machine's functions, flexibility, quality, productivity, usability and environmental aspects. On DataMaster Online you can compare Sharp MX-3050V with its competition. 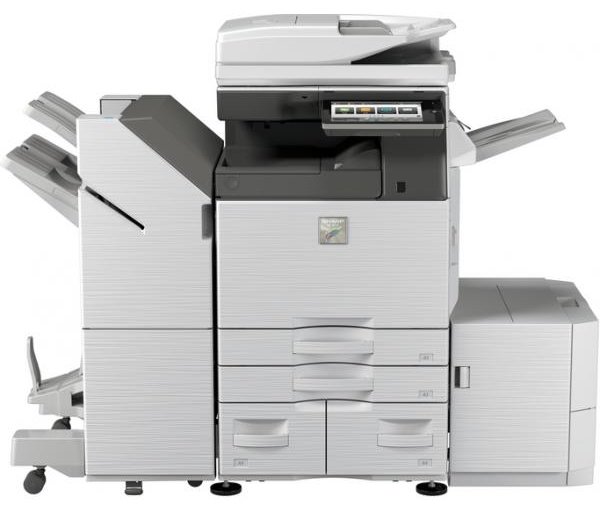 DMO provides comparisons of photocopiers, MFPs and printers including the Sharp MX-3050V as well as its competitors. On DMO you will find the strengths and advantages of the Sharp MX-3050V as well as the weaknesses of the Sharp MX-3050V and its cons. DMO gives you technical specifications and all the technical information on the Sharp MX-3050V and its competitors. All the A3 finishing options for the Sharp MX-3050V. Benchmarking Sharp MX-3050V : certificates, productivity reports, evaluations of the Sharp MX-3050V and its competitors. Easy-to-use comparison tools showing strengths and weaknesses, pros and cons and all the technical information on the Sharp MX-3050V and competing machines. Analysis of productivity, quality, usability, functions, flexibility and environmental aspects of the Sharp MX-3050V. DMO is a sales tool with a feature for replying to bids and tenders concerning the Sharp MX-3050V. On the DMO Benchmarking portal you will also find full details of compatibility of the Sharp MX-3050V with software Solutions. We have redesigned the Product Page of the DataMaster Online portal for print sales and marketing professionals!